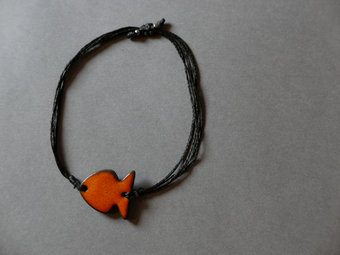 My bracelet is shaped like a fish; it is a representation of a salmon. Salmon are born in the rivers and travel all the way down to the sea. They spend years in the oceans then, after some time, they manage to find the river back to where they were born. They travel back to the exact place they were born, and die there at the end; I find it so inspirational. I believe that if everyone were able to feel and act like an artist, there would be no wars in the world. “Make Art Not War” is a quote of a lifetime.